Wow, did you guys love my Raw Cinnamon Toast. Thank you for all the great comments and feedback. I love it when blogging becomes a conversation. Of course, there were questions. Lots of questions. Chief among the questions was, “can this be made in an oven?” But, I also got questions about making it without nuts. Behold, the nut-free, vegan, baked version of cinnamon toast. Honestly? I like the raw version more. I ran out of patience when baking it. (Okay, I was tired and I wanted to go to bed.) So, this is not as crispy as the raw version. And, I prefer the taste of almonds to the taste of sunflower seeds. But, it did just pass the test with two 2nd grade boys. With no added sugar. That’s kind of saying a lot, don’t you think? In a food processor, process the sunflower seeds until you have a fine meal. You’ll notice the difference in sound when it goes from seed to meal. Be careful not to go too far and end up with sunflower seed butter. (That should be a different post, eh?) Pour the sunflower seed into a small bowl and set aside. Add the pear to the food processor and process until you have a smooth puree. (I did not need to add any water – my pear was very ripe. You may need to add just a touch of water, depending on the power of your food processor and the ripeness of your pear.) Put the sunflower seed meal, the flax seed, vanilla and cinnamon back in the food processor and pulse until well mixed. Stir in the raisins. Roll out to cracker thickness between two sheets of parchment. It will be sticky. You’ll lose a little dough to the top sheet of parchment when you peel it off. So it goes. Bake until the crispiness you desire. Have patience. This will take a while. It took more than an hour for me. Time will vary depending on the temperature of your oven. Just keep checking it to see if it’s crisp enough for you. For more slightly indulgent recipes, check out Slightly Indulgent Tuesdays. For more sugar-free recipes, check out Sugar Free Sundays. 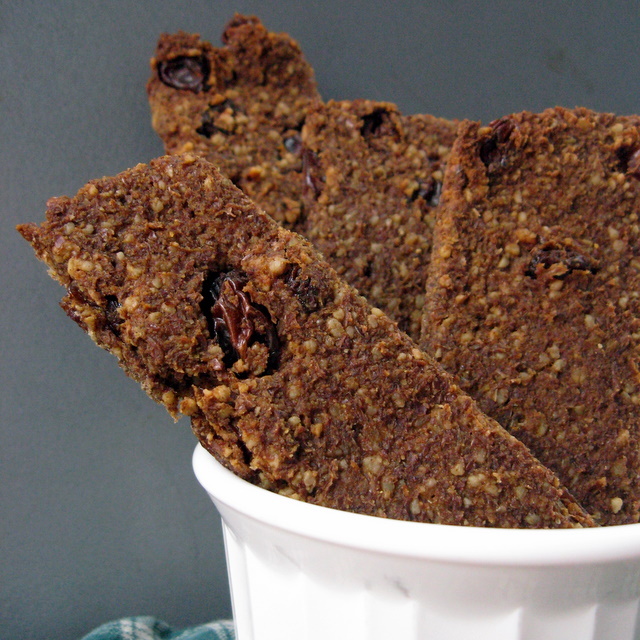 This entry was posted in breakfast, flax seed, grain-free, nightshade-free, nut-free, pear, sunflower seeds, vegan and tagged cinnamon, grain-free, nut-free, recipes, vegan. Bookmark the permalink. Hi Deanna! Thanks for brining this to this week’s Sugar Free Sunday potluck. My stomach just growled looking at this crisp’s picture.. 🙂 I’ll take that as a sign to buy some pears soon. Yeah – I think I’ll do that since waiting for the pear to become overripe is going to be agonizing! I’m oven-bound, so thanks for sharing this version Deanna! I’ve done something similar with chili powder, but it never dawned on me to try it with cinnamon and raisins. This just sounds too good! !